This is in the same Price range as a Hellcat pushing 707hp. This is IMO crap. This is not a U.S. market vehicle. This is not a mass production trim. Comparing it to anything but short run models available in the Japanese market is completely useless and futile. Please learn to comprehend what you are reading. quite aware of what I'm reading. I don't care if they only made one for the Japanese market, my opinion that this is crap will still remain. I love how everyone here is an expert on numerous tracks around the globe. You guys are...wait. Had to edit because name calling isn't allowed on this forum. sure sure it's only speculation on my end anyways. My reason for thinking this was the course of history. the 10 series and Mongram series, no exterior upgrades aside from the HIDs, Sharkfin antenna, and in the case on the 10 series, the unique color. and since the RS models are different every year it leads me to belive they'll use the griffon as inspiration for the 2.0 unless they use the GT-S kit instead. I figure it's only a matter of time. The FRS/BRZ was not meant to be a world beating car, it was not meant to be an extremely fast car, nor a powerful car, but a well balanced fun car. Looks like a 400hp monster. It's like Toyota likes making cars that look fast but are meh and Subaru makes cars that go fast but look meh. They should colab for the next RS or Special Edition.. $60,000!?!?!? Are they serious!? That's a 2015 Corvette a 2015 Z28 Camaro and a Challenger HELLCAT!!!! Actually, no, not $60k. They aren't selling it in USD. It is total crap!! For $60,000 you could almost buy a VW Phaeton!! ZOMG!!!! Maybe a muscle car coming up in some people's minds instead of a Porsche means they probably bought the wrong car. That said, for the money I do think it's unfortunate that they cut some obvious corners on this. It's obvious based on the limited 100 units and Japan only sales that this might be a move to get the 86 into certain racing classes. I hope part#'s do eventually show up. 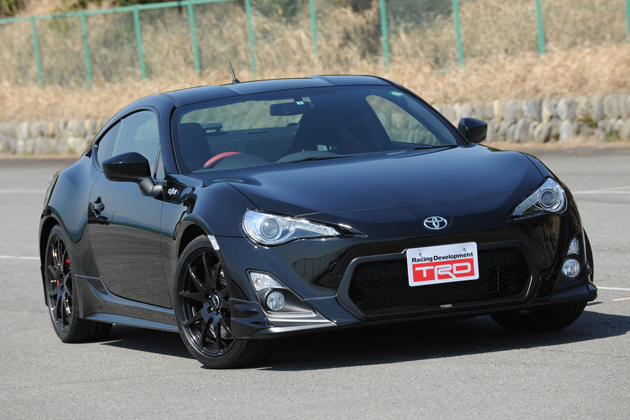 The base price of a GT86 in the UK is £25k, the 14R60 is priced at £36k. I have done a rough total up of the upgrades on the 14R60 and I am up to £14k already. That's without the modified transmission, the magnesium wheels as well as a few other bits and pieces and of course, labour. Even if all the parts were available you could not replicate this model for anything like the (low) price they are selling it. Yep, the forged magnesium wheels, coilovers, carbon roof, one piece seats, brake kit, mechanical LSD, gearbox, etc cost a shitload of money. Hell, you are $8k in to just build a semi-competitive STX class auto cross car. People here think you can build a race car for nothing. People here think you can build a race car for nothing. Well some people here seem to think a race car is a 4000lb whale with 707hp and a warranty from Dodge.